If you are thinking about building a log home but aren't sure what is involved, here is the seminar for you! Seminar space is limited. To make a reservation please call 1-800-280-2574. Pre-registration fee with credit card is required. Cost is $25.00* per person. Seminar dates are subject to change.- Please call in advance for scheduling confirmation or view the EVENTS link on our website www.applog.com. * By investing your time and money in attending one of these educational events you will earn a GREAT return. Each paid attendee will receive a coupon that is good for $250 in additional Options (maximum $500) on their PREMIER, PIONEER or Frontier house order when it is placed within 1 year of the Plant Tour/Seminar attended. MORNING SESSION - 9:00 A.M. - 12:00 P.M.
During the morning session you will learn more about Appalachian Log Structures and the advantages of our log home building systems. We will also offer valuable information on establishing a budget, financing, floor plan design, the manufacturing process, delivery process and much more. You will begin the afternoon session by touring our Brushy Creek manufacturing facility in Princeton. You’ll see how your blueprints are transformed into a quality, precut, lettered and numbered (Premier) building system. 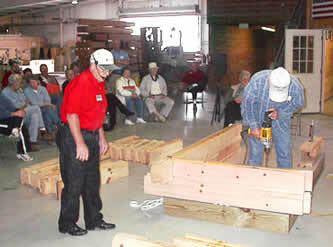 Afterwards, gain "hands-on" experience by helping to construct a full size corner section of a log home. This will include installation of the logs, gasket, caulk, thru-bolts and jambs for the door/window openings. While this session will be limited by time constraints, it will demonstrate the general construction techniques resulting in a better understanding of our building system. Learn the 10 Steps to make your dream log home become reality. Learn about the advantages of our Clear-Treat borate pressure treatment. Meet some of the ALSI Staff who you will be working with. Talk with other attendees who are on the same journey to build a log home as you are. Ask the questions that are the most important to YOU! Sign Up for Our Plant Tour and Seminar Now!